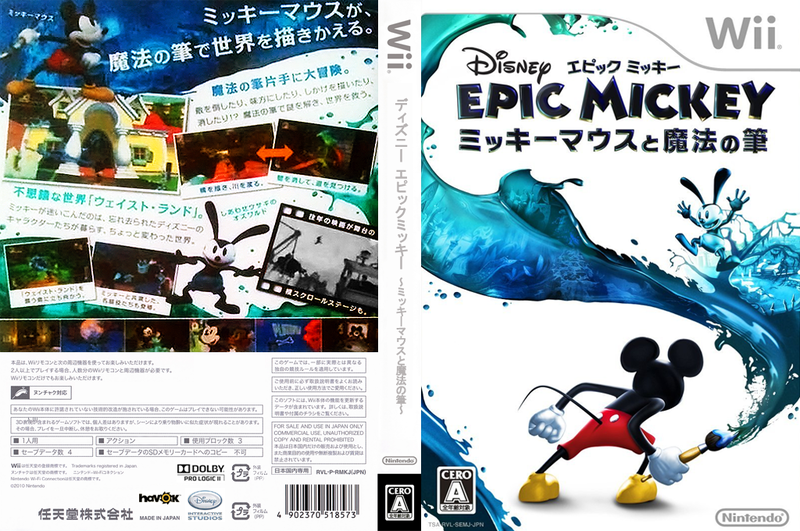 synopsis (EN) Disney Epic Mickey is an action-adventure platforming game for the Wii console that sends Mickey Mouse on an epic journey of creativity and discovery. As Mickey, the player is propelled into Wasteland, an alternate world made up of Disney’s forgotten creative efforts, and is given the power to wield paint and paint thinner to dynamically change the world while determining Mickey’s path to becoming an epic hero. Through the use of this unique paint and paint thinner, the key components of animation and Mickey’s tools for impacting his world, players will have the ability to shape how the story unfolds as they discover the concept of “Playstyle Matters” – an innovative style of gameplay created by Disney Interactive Studios’ Junction Point, led by industry luminary Warren Spector, where players creatively tackle different challenges in the world to explore all the possibilities and storylines – but with consequences for their chosen actions. synopsis (ES) Mickey es transportado a un páramo, un mundo alternativo creado a partir de los esfuerzos creativos olvidados de Disney, donde recibe la capacidad de usar pintura y disolvente para cambiar dinámicamente el mundo. ¡Embárcate en un viaje legendario de creatividad y descubrimiento!